​Uniquely situated within an Area of Outstanding Natural Beauty and a World Heritage Site, Burgh-by-Sands has witnessed the dramatic ebb and flow of the tides of history, as well as enjoying a delightful location on the Solway Firth. We hope visitors will find pleasure in exploring the village. 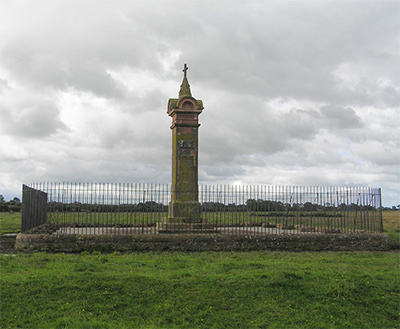 Created in 1092 as a bulwark against Scottish invasion across the Solway, the barony has been held by eight great northern families over the last 900 years. It has passed by female descent through the D’Estrivers, Engaines, Morvilles, Lucies, de Multons, Dacres and Howards before being sold in 1685 by the Duke of Norfolk to Sir John Lowther, whose descendants the Earls of Lonsdale have held the title ever since. The Barony included Bowness, Burgh-by-Sands, Beaumont, Kirkandrews-on-Eden, Grinsdale, Kirkbampton, Orton, Aikton and Thursby. As a physical presence small defensive castles were built at Drumburgh, Burgh, Beaumont, Aikton and Rockcliffe. Drumburgh Castle is a visual reminder of how impressive these mini fortresses must have been, situated in an area of small clay built and reed thatched cottages. A reminder to those on both sides of the Solway of the power of their new Norman overlords, Burgh Castle situated at the eastern entrance of the modern village, is long gone but another defensive feature from the same era remains. The church tower, like that at Newton Arlosh, stands testament to the need for a place of refuge for the local villagers. This church is most unusual formerly having two towers, one at either end. The eastern one was used as a priest’s house and on falling into ruin in the early eighteenth century had its top removed and was converted into a schoolhouse before becoming the present vestry. The parish is some nine miles in circumference and lies on the south side of the Solway, the estuary of the River Eden. This includes some 1500 acres of rich alluvial marshland, which is also part of the internationally important Upper Solway Flats and Marshes Nature Conservation Site. The north of the Parish is also within the Solway Coast Area of Outstanding Natural Beauty and the Hadrian’s Wall World Heritage Site. The main village is Burgh-by-Sands, itself made up of several historic smaller settlements such as Burgh Head and West End. To the south lie the villages of Moorhouse and Thurstonfield both with strong Quaker connections. The Friends Meeting House at Moorhouse was built in 1733 and is now a private home. Bonnie Prince Charlie also visited the village and stayed at Stone House on the night of 10th of November 1745, before continuing on to lay siege to Carlisle. At Thurstonfield there is an attractive Lough or small lake, once there were many of these in the area, used to drain the land and also as reservoirs for the Carlisle ship canal, which opened in 1823. The run off from these Loughs was often used to power the local water mills. To the west of Burgh lie the hamlets of Dykesfield and Longburgh. Dykesfield takes its name from a local term for the Roman Wall or Dyke. Longburgh is an attractive settlement which once had its own brewery and the unusually named Rat Trap Inn, both long gone. At the western border of the parish is Boustead Hill, which is situated on a promontory above the marsh and has an attractive collection of C18 and C19 farms and houses, evidence of the growing agricultural prosperity of the area during that period.